Blast About offer a licenced, fully insured pressure cleaning / washing service across the whole of the Sunshine Coast. For a professional, friendly service at competitive rates give us a call now. 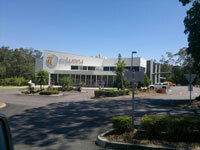 We cover all areas on the Sunshine Coast from Noosa to Caboolture including country areas. Below is just a sample of the areas we service. Calvary Christian Church is a significant building - approximately 3000 m2 over three levels and with over 1200 m2 of exposed aggregate paths and driveways surrounding it. We have a policy of maintaining our facilities in excellent condition and appearance. Due to the size of the facility, and our location adjacent large bush areas, much of the exposed aggregate concrete paths and driveways, metal wall cladding and roof areas are shaded for significant parts of the day, resulting in mould growth that detracts from the facility apperance, creates maintenance issues and has the potential to create undesirable hazards. We recently engaged Rob Marsh from Blast About to pressure wash paths, facades and roof areas around our building. The results as depicted, speak for themselves. Rob's focus on customer service is incredible. He completed the work to the highest standards of safety management and workmanship, attention to detail and with the utmost cooperation. Our building is highly utilised, requiring the work to be completed to a detailed schedule, working around our various activities whilst providing minimum interruption. Nothing was too difficult and Rob stuck meticulously to the schedule. Rob's communication with us was excellent. He kept us informed of progress and made sure we were completely happy with the quality of work. He worked with us to complete additional work and knowing we had a strict budget, quoted extras immediately, so there were no surprises. I highly recommend Rob Marsh and Blast About and will certainly be talking to him in the future when we need this work completed again.